SUR-FIT Natura Flexible skin barrier/wafer has rounded edges for a more comfortable fit, low profile flange and split-release paper backing for easy application. Stomahesive skin barrier/wafers are ideal for people whose stoma output is semi-formed to formed stool. These barrier wafers are cut to fit to work with most body applications. Begin by cleansing the peristomal skin with mild soap and water (soaps should be free of oils and creams). Pat dry thoroughly. The skin should be free of any solvent or greasy substances. 1. Measure the stoma size with the measuring guide provided. 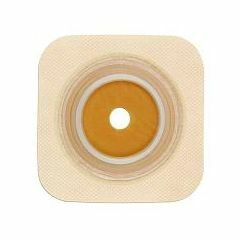 Select a skin barrier/wafer with a flange (white ring) that is at least 1/2” (13mm) larger than the widest diameter of the stoma. If this size is not available, go to the next larger flange size. 2. Trace the exact stoma size onto the center white release paper in the back of the skin barrier/wafer. The small starter hole should be in the center of your tracing. Cut along the tracing with curved, short-blade scissors.For skin barriers/wafers with precut stoma opening: Select a skin barrier/wafer with a precut stoma opening the same size as the largest diameter of the stoma. Do not enlarge the precut stoma opening. Remove white release paper from the skin barrier/wafer. Leave the outer release paper on the tape collar in place. 4. Place the skin barrier/wafer gently in position over the stoma. Press the skin barrier/wafer against the skin, paying particular attention to the area closest to the stoma. During application, maintain gentle pressure on the skin barrier/wafer for 30 seconds to improve adhesion. 5. After the center disc is in place, remove one side of the release paper on the tape collar and smooth onto the skin. Repeat with the other side, making sure the tape is smooth and wrinkle free. Important: The Durahesive skin barrier/wafer will swell around the stoma, resulting in a “turtlenecking” effect. This is a normal function of the skin barrier/wafer and will not harm the stoma or prevent flow of urine or stool, even if the stoma is completely covered. Make sure that the inner surfaces of the pouch are separated and that the pouch contains a small amount of air. Position the pouch flange over the skin barrier/wafer flange. Gently press two fingers around the entire flange area starting at the bottom or 6 o’clock position and moving up on both sides of the flange to the top or 12 o’clock position. You will hear or feel a series of audible “clicks” as the system locks securely into place. Simply snap pouch on to the skin barrier/wafer. For attachment of the tail clip, fold the bottom of the pouch over the tail clip only once. Press firmly on the center of the clip until it snaps securely closed. Make sure the tap on the pouch is closed before attaching pouch to skin barrier/wafer. To easily disconnect the skin barrier/wafer from the pouch, firmly pull downward on the pouch tab and lift the pouch off. Closed-end pouches provide quick, easy and discreet pouch changes. Remove the closed-end pouch, place it in a plastic baggie and discard it in the nearest trash can and/or in accordance with local disposal regulations. Do not flush the pouch in the toilet. Gently pull the skin barrier/wafer down, away from the skin, while supporting the adjacent skin with your other hand. I have tried many but love this one. Safe. Sturdy. Lightweight. Easy to cut manipulate. Easy Storage. I really enjoy the flexiblitly of being able to use a realiable product for my personal needs. I have never had a problem with the product and have been using them for years. Lightweight. Safe. Sturdy. test. Free. Move. Trust. Easy Storage. Caregiver. Average Health. Medical Professional. this is the same product the hospital sent home with us after surgery. In hot climate. In hot climate. In humid climate. Spread powder on skin then use Convatec protective skin barrier. Add another layer of powder and skin barrier. Then apply wafer. This will alleviate any redness on skin due to extreme heat and humid climatic conditions. ConvaTec makes tremendous products that are safe, secure, durable, and high quality. In 28 years, their products have almost never had any issues and are head and shoulders above the products of other companies. Can I shower with the Natura Sure Fit? It seems like it would not adhere as well with moisture. Does Convatec Natura 2 1/4 in pouch REF 401523 fit this flange? Is this product latex free? will this wafer fit with Hollister New Image 18364 pouch? Yes. Just make sure to get the 5X5 wafer with the 2(3/4)flange. I don't think the Hollister pouches fit Convatec flanges. Lips on Hollister pouches have a narrower seal. would this barrier/wafer work on the (Assura 2-piece EasiClose WIDE Outlet Midi Ileostomy Bag - Opaque, 10 1/2", 485mL)? I am not sure if this would fit. I would check with one of the reps to be sure before ordering.